WARRANTY LOADED 6-PASS DIESEL WHITE/GRAY ALL ORIGINAL ALL NEW TIRES CLEANEST TRUCK TOW PACK ALL BOOKS KEYLESS ENTRY/ALARM RUNNING BOARDS POLISHED ALLOYS RUNS STONG AND FAST This truck has been a total pride-of-ownership and is so clean front to back non will compare. All the power options and seating for 6. Non smoker. A 5year/100k mile additional service contract is available and can be used at any Ford dealer nationwide. Turn key and go enjoy. Pull all your toys in style. Only 143k miles. Priced well below KBB and the market for this excellent condition. We are a Carfax Advantage dealer. Carfax certified with buyback guarantee. Has just gone through pre-sale inspection, smog, safety, and certification. Cancellation contract/buyback option available if you are not completely satisfied!! Call directly between 10am and 6:00pm Monday through Saturday in Escondido at 877-514-8926. We are located at 234 West 3rd. Ave Escondido, Ca. 92025. We are happy to answer any questions you may have. We are a family-run business and have been owner-operated for over 30 years. You are purchasing this vehicle from a licensed, bonded source with the assurance of a full mechanical inspection, smog check, and certification upon delivery! This is not a risky private-party purchase without recourse. You can meet the owner directly, have peace of mind, and the assurance of a physical presence. Very low rates available and 72 Month term O.A.C. Bad Credit OK! Trades are welcome. Many forms of payment are available. A purchaser is welcome to check out our vehicles as much as they like onsite. Our last test drive is at 5:30 and we close at 6:00 Monday-Saturday unless otherwise scheduled with sales. Baldwin Auto Sales does not guarantee electrical components or accessories, including but not limited to-factory installed/aftermarket cd players, dvd players, touchscreens, or navigation units. COME IN AND GIVE US A REVIEW YOUR OPINION IS VERY IMPORTANT TO US. 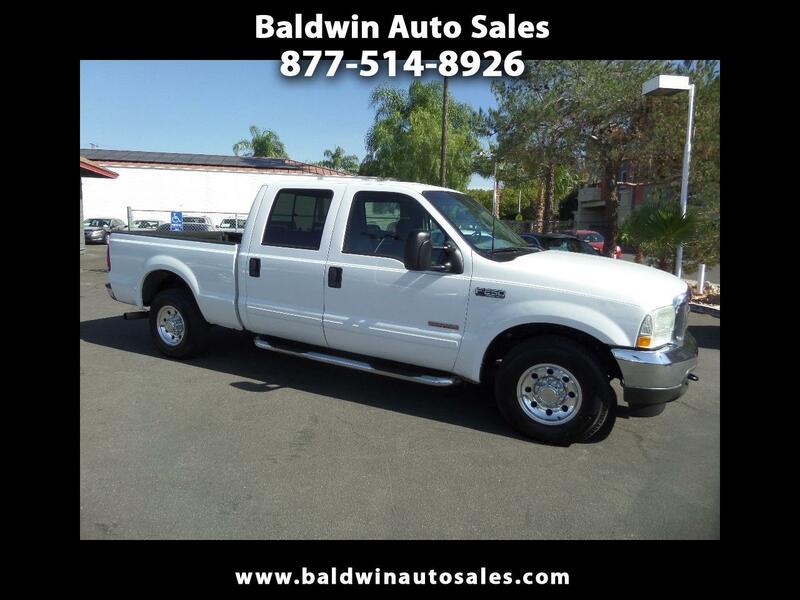 Visit Baldwin Auto Sales online at www.baldwinautosales.com to see more pictures of this vehicle or call us at 877-514-8926 today to schedule your test drive. Our last test drive of the day is at 5:30 unless otherwise arranged with sales and we normally close at 6:00. Message: Thought you might be interested in this 2003 Ford Super Duty F-250. We have been operating as a family business in San Diego county since 1983. Our inventory is always extremely clean and our prices will almost always be lower than the competition for the year, make, and condition. You deal directly with the owners' when you are here and never have to wait to get an answer on an offer that is reasonable and justified. Our climate controlled facility is very spacious, open, and luxurious with wireless internet access and plenty of room. Call us anytime during business hours at 1-877-514-8926 or visit our website www.baldwinautosales.com.